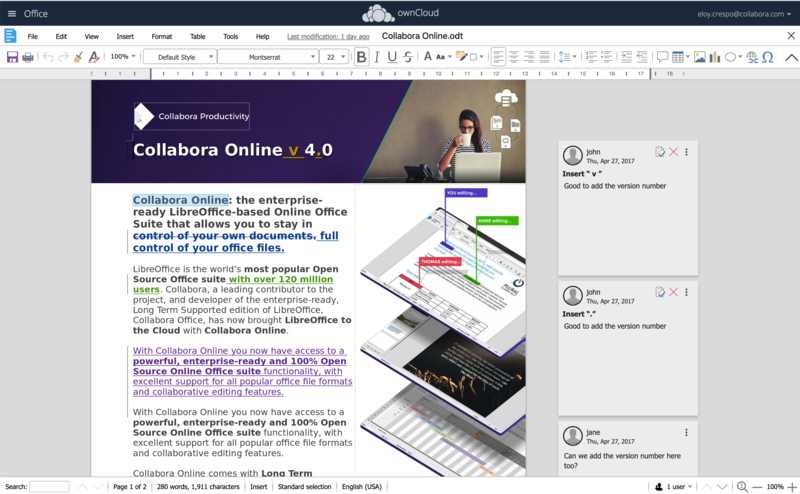 In this article I would like to introduce you to the most important features and benefits of Collabora Online, explain the possibilities of using it to meet data protection requirements together with Nextcloud or ownCloud, and show you how easy is to integrate and operate Collabora Online with Univention Corporate Server (UCS). You will also learn that Collabora Online in UCS offers a pre-built environment, pre-configured packages and a friendly UX that makes the integration process extremely easy and straightforward by including Nextcloud or ownCloud appliances preconfigured as data storage. 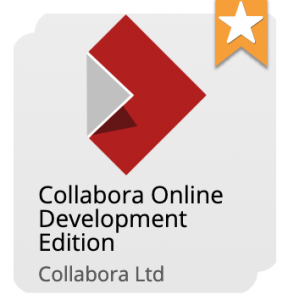 At the end, you will get a short overview about the main differences between our two versions: Collabora Online Development Editon (CODE) and the supported Collabora Online, both available in the Univention App Center. Collabora Online is an open source software component based on LibreOffice that can be easily integrated into any web application, and which enables viewing and collaborative editing of Office documents in dozens of file formats. 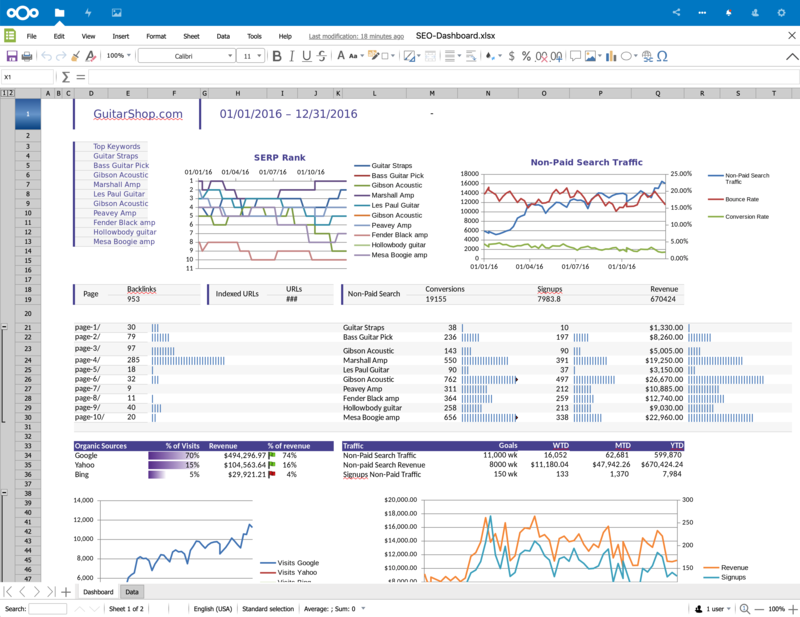 Collabora Online includes support for text documents, spreadsheets and charts as well as presentations. 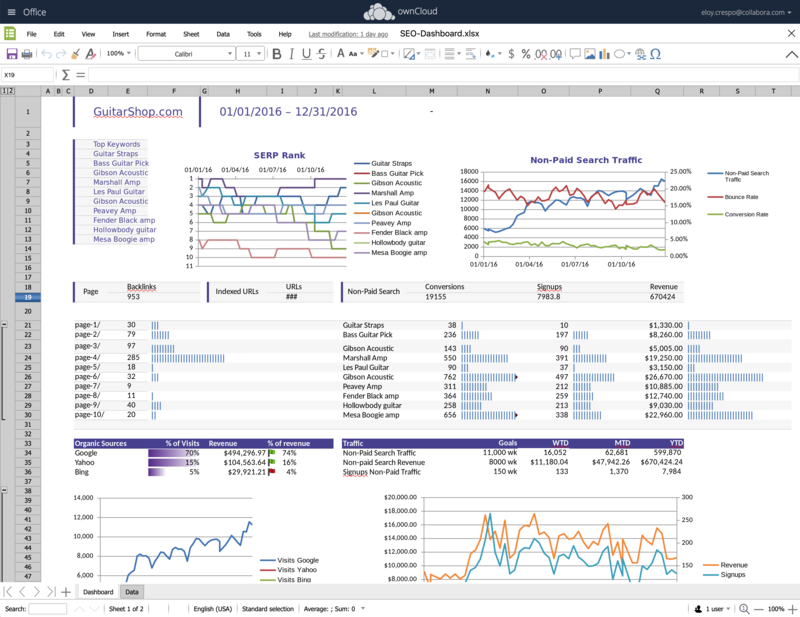 It provides an easy-to-deploy office suite that runs directly in any modern browser, on all your devices. Being able to easily deploy Collabora Online on Univention Corporate Server on-premise makes it easy to protect all of your data and documents. In addition you can keep the processing and communication on your own hardware and (virtual) network. This keeps all of your data inside the right jurisdiction and control and makes GDPR compliance very easy. In contrast, even when a public clouds locates data in a given jurisdiction, people from outside can access the same hardware and potentially access your data. On-premise Collabora Online can protect you from this – making it ideal for certain industries, such as Pharmaceutical, Medical, Health, Education or Finance and Banking, Insurance, Legal and/or Military – as well as privacy conscious home users. Enterprises can get access to our huge depth of experience, combined with long term support, security maintenance and ease of deployment features, while home users can enjoy and try out the very latest technology. 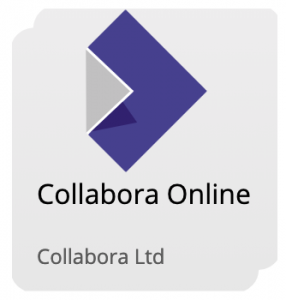 Collabora Online gives all users access to the leading non-Microsoft implementation of an Office suite, with the ability to provide high fidelity import, rendering, editing and export of the vast majority of extant office documents formats. While our native document model is inspired by the Open Document Format (ODF), Collabora Online, can import and export Microsoft DOCX, DOC, RTF, XLSX, XLS, PPTX, PPT and their macro containing variants such as DOCM or XLSM. In addition Collabora Online has support for viewing many other file formats such as PDF, Visio, Publisher, Keynote, Numbers and Pages as well as many other more obscure formats. And of course, Collabora Online has a responsive mode, allowing collaborative editing and a touch UI for any kind of mobile devices with a browser, such as iOS (iPad or iPhone) and Android. Collabora Online provides rich document editing but it is necessary to marry this with data storage and authentication. Thankfully both Nextcloud and ownCloud share our vision of secure,- on-premise data management – and provide rich underlying storage and authentication infrastructure for our product. With Collabora Online for Nextcloud and ownCloud you will get the security you need. You are in full control of sensitive corporate data and you can deploy multiple instances wherever you like, to suit taste, collaborators, and security. With the Univention Collabora Online app appliance combined with Nextcloud or ownCloud, you can install Collabora Online with an already integrated and preconfigured ownCloud or Nextcloud. Once you have completed a simple graphical setup with a web-based administration interface, you can use the online office and cloud file sharing solution directly. Collabora Online in UCS offers a pre-built environment, pre-configured packages and a friendly UX that makes the integration process extremely easy and straightforward. Collabora Online in UCS is pre-packaged as ready-to-run virtual machine images, with multiple industry-standard virtual machines available and with a minimal configuration needed. It is compact and with minimal overhead. In the appliance, Nextcloud or ownCloud are already preconfigured as data storage for Collabora Online. This way you save the additional effort of installing and configuring a data storage plugin. We offer two different on-premise versions of Collabora Online in UCS – both versions offer easy integration with Nextcloud and ownCloud. First we offer CODE, our development edition. CODE contains the latest developments and is perfect for home users that wants to start to run their own online Office Suite. We want as many people as possible to try it out and get back control of their own online documents. But, we do not recommend CODE for business or production environments as it has a limitation of 10 documents and 20 users. You can check for more CODE information on our website. Naturally, we offer our professional version for production environments – Collabora Online. This is our scalable, commercially supported version with Long Term Support, signed security updates and a Service Level Agreement. With Collabora Online supported version you will get support for large deployments on multiple CPUs and 1000’s of users, priority support and bug fixes, extended security updates and problem temporary fix patching for your issues, and much more. You can check out the Collabora online app in UCS. This February we released our latest version Collabora Online 4.0. That includes a fresh look, mobile improvements, improved interoperability, new dialogs, new functionality and much more. 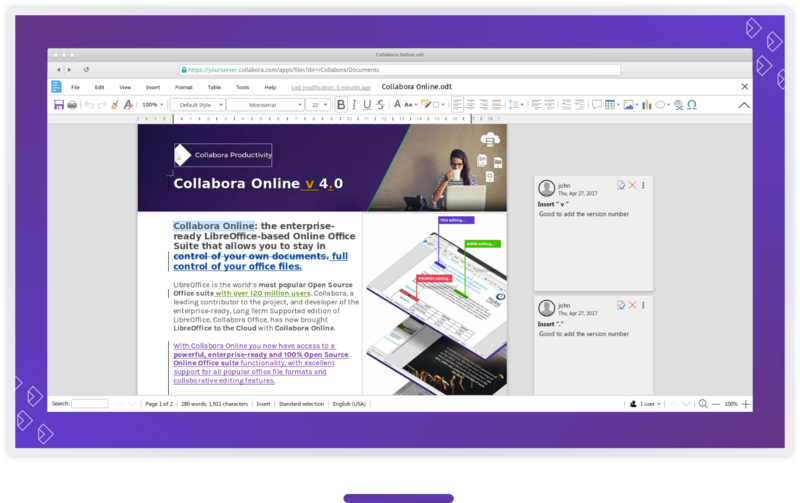 You can check out the latest release notes for Collabora Online 4.0 on our website. Please, feel free to contact us for further information at hello@nullcollaboraoffice.com. 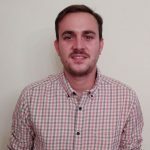 Eloy Crespo has lead Collabora Productivity's Sales and Business Development since 2016. He loves to help new customers of every size, from small to huge enterprises, experience the fun of their own private, on-premise office suite. He specializes in getting partner and customers setup, switching on their SLAs, and plugging them into the rest of the company for a smooth Collabora experience.